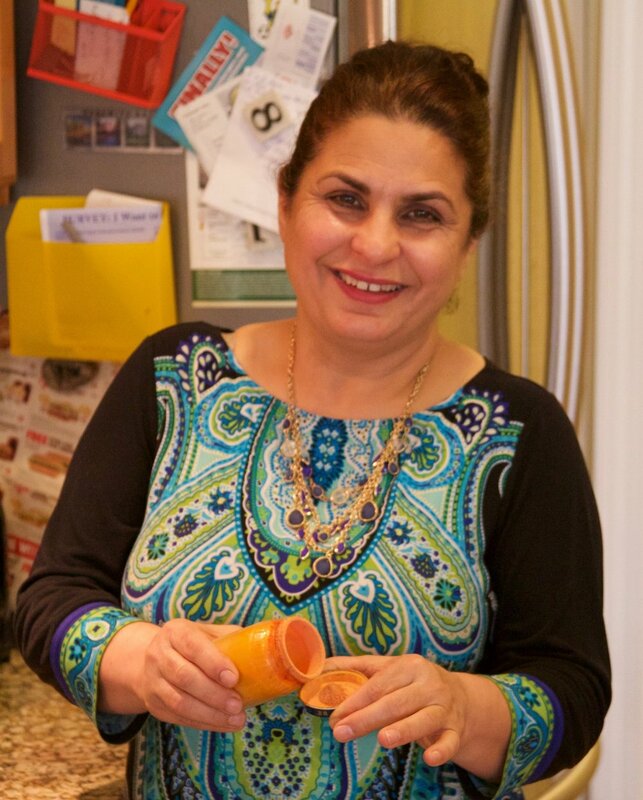 Parivash Rohani heard about Immigrant Kitchens from a friend and reached out to see if she could be involved. In her home in Portland, Maine, she taught me how to make her favorite Iranian dish, called fesenjoon. It's chicken breast cut into cubes and cooked in a nutty sweet and sour sauce that's kind of like Persian bar-b-q sauce, but without the tomato base. Ground walnuts give the sauce body, richness, and a touch of bitterness. Pomegranate molasses adds dark red color and pungency. Fesenjoon is really too intense to be eaten straight in a bowl. It’s perfect served over saffron-colored basmati rice. You couldn’t have a better match for fesenjoon’s bold flavor than a Shirazi salad, named after a town where Parivash spent her teenage years in Iran. Lettuce, cucumbers, and tomatoes, tossed with lime juice, olive oil, dried mint, and sumac, make for a fresh, cool accompaniment. She remembers her mother using the juice from unripe grapes called ab ghooreh instead of the lime juice. Parivash's mother and father still live in Iran, but 16 of her friends from childhood were executed by the Iranian government between 1982 and 1985 for believing in her religion, the Bahá’í Faith. It is the largest minority religion in Iran. When she was just six years old, fanatical Muslims threw stones at her and pulled her hair. In her teens, an angry mob of Muslims burned her home to the ground along with those of 500 other Bahá’í families. In 1979 the Islamic government denied Bahá’ís access to higher education and work, and started imprisoning and executing them. Parivash fled to India with two cousins when she was eighteen, thinking she would stay until the persecution ended. Parivash loves making this meal because her husband and grown children love to eat it. She met her husband, who is also from Iran, when she was in exile in India. Their daughter was born there. One son was born in Canada, and two sons were born in Brunswick, Maine. Her daughter is now a nurse; her son, a pharmacist; and two sons are college students at University of Southern Maine. After working in nursing for over 20 years and raising her family, she now dedicates her time to building community and helping humanity. She is on the board of the Maine chapter of Interfaith Power and Light, an organization that brings diverse religious groups together to save the earth. She volunteers on the “Education is Not A Crime” campaign, setting up documentary film viewings and speaking at educational institutions about the continued deprivation of education for the Bahá’í in Iran. She is also working with local organizations in Portland to plan this year’s festivities for World Refugee Day on June 20th.